The Detroit Free Press/Chemical Bank Marathon is the only International Marathon in the United States. Crossing the U.S.-Canadian border is the highlight for many runners, but this year two marathoners crossed another major threshold during the 26.2-mile run. 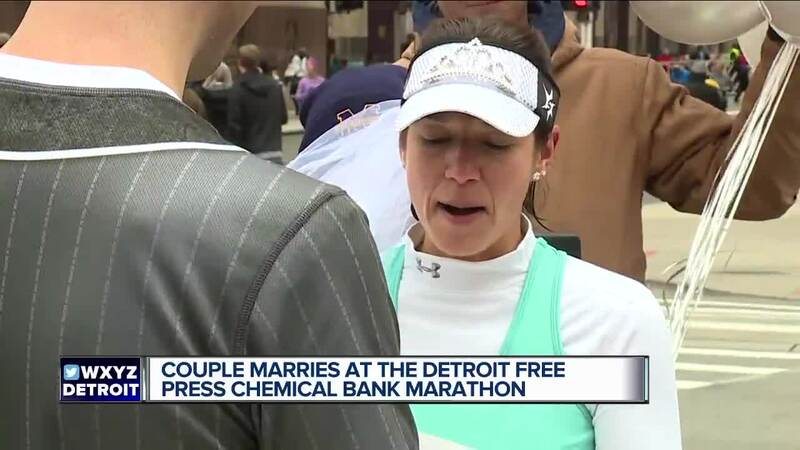 Whitney Black and Steven Phillips started the Detroit Free Press/Chemical Bank marathon engaged, and sealed the deal halfway to the finish line. What’s even more mind blowing than a mid-marathon wedding is that no one thought Whitney would ever be able to walk down the aisle, let alone run. She was seriously injured in an accident over 10 years ago and then hit by a car while running 18 months ago. "Twenty-one surgeries in total, (Whitney) was told she may never walk again," says McCann Black, Whitney's brother. "I’m just so proud of her, watching her set these goals and then blow through them has helped our family a great deal." Today, 13.1 miles into her very first full marathon, Whitney married her “sole mate,” Steven Phillips. Phillips, by the way, has had quite a journey of his own, losing around 100 pounds. Friends and family waited near the 13.1 mile marker with balloons, a veil, rings and an officiant until Whitney and Steven ran up to the makeshift altar. "I promise to trust you even when we deviate from our grocery list," Whitney vowed. "I will choose you every day, not because I have to, but because I want to," Phillips said. Their vows were short and sweet. The ceremony lasted about five or six minutes. The couple said getting married in the midst of their first marathon was a perfect setting for their relationship. "We challenge each other to do better in every way," Whitney said, then she toasted her new husband with a shot of Gatorade and the two rejoined the race. Crossing the finish line as husband and wife and committing to stay by each other's side for the long run. "To see my baby sister getting married, it’s a lot to take in, but I’m just so happy for her," McCann said. This was the first-ever Detroit Free Press/Chemical Bank Marathon, according to the Freep .